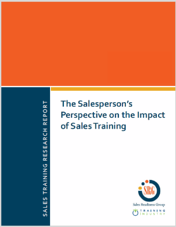 SEATTLE, WA — July 6, 2018 – A new research report, The Salesperson’s Perspective on the Impact of Sales Training, published by Sales Readiness Group and TrainingIndustry.com, revealed that companies with effective sales training programs were more likely to have faster ramp-up times, lower turnover, and higher close rates. The insights in the report are based on self-reported answers provided by 287 sales professionals in business-to-business (B2B) roles. The report explores how much they value the training they received. This study intentionally surveyed sales professionals as opposed to Learning & Development professionals to collect the perspective of those in the job on how well the training they receive meets their needs. Over 50 percent of the companies surveyed had over 1,000 employees and came from a wide array of industries. Nearly half of all respondents have been in their roles for more than five years, and the distribution of ages across workforce generations was relatively balanced across millennial, Generation X and Boomer employees. Sales Readiness Group (SRG) is an industry leading sales training company. Our mission is to help improve the performance of sales teams by providing customized, skills-based training programs that produce sustainable behavior change. Our solutions include comprehensive sales training, sales negotiation, sales coaching, and sales management programs. Contact Sales Readiness Group at 800.490.0715. Training Industry focuses on helping dedicated business and training professionals get the information, insight, and tools needed to manage the business of learning more effectively. The website, TrainingIndustry.com, spotlights the latest news, articles, case studies and best practices within the training industry. Contact Training Industry at 866.298.4203.